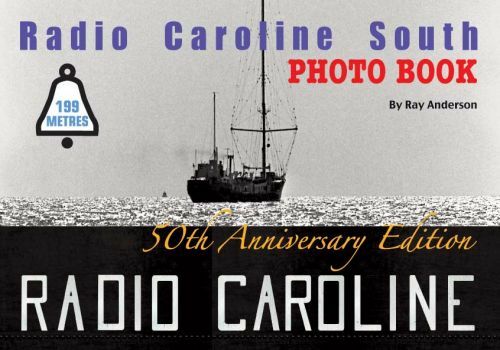 The Radio Caroline South Photo Book is without doubt, a superb ‘5oth Anniversary Edition’ souvenir account of the story of Radio Caroline, broadcasting from the MV Mi Amigo off the coast of Frinton-on-Sea in Essex. This book includes the story of Radio Atlanta, and follows the station through her halcyon days during the 1960s. In this A4 Landscape size, 84 page photo book it tells the story of the station using a fabulous selection of black & white and colour photographs printed on high quality gloss paper. Many have never been seen before - together with items of original Radio Caroline memorabilia. You’ll see the events in January 1966, when the MV Mi Amigo went aground on Frinton beach. Including photographs of the MV Cheetah II - Radio Caroline’s replacement ship while the MV Mi Amigo was being refurbished. This photo book is a must for any Radio Caroline/Mi Amigo fan and covers the story up until March 1968, when the radio ship was towed away to Holland. The most comprehensive list of on-air personalities, DJs and newsreaders ever put together, is included. Ray Anderson has painstakingly researched and produced this photo book which is the second in a new series celebrating ‘The Golden Age of Radio’ to celebrate the 50th anniversary of these great stations.